Mark West, MD at Damage Doctor, is very proud of his team currently working in London on a 34 story hotel build. Our dedicated team of Mobile Surface Repair Technicians headed up by Regional Supervisor Simon have been on site for the last 4 weeks working room by room and floor by floor to ensure the client is ready for their tight deadline and first paying customers later this month. 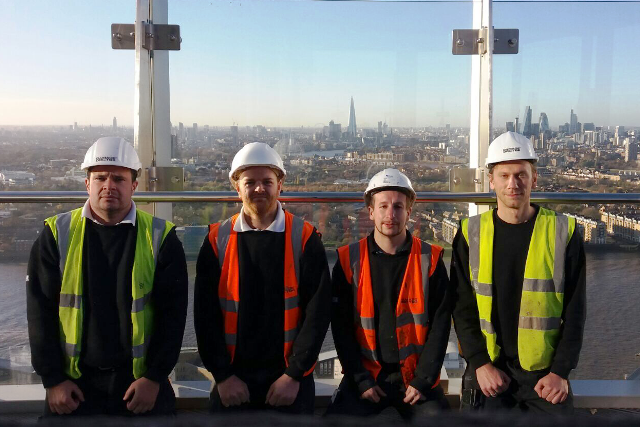 This picture was taken of the team recently on the top floor showing the stunning London background they have had the pleasure to see everyday when the weather has allowed. We look forward to completing this large project on time and delivered in the professional manner that Damage Doctor has become renowned for. Well done Simon, Jim, Tony and Kris.